It's been just five years since the deadly fungus was first identified in a small population of New York bats. In that time, "white nose syndrome" has spread to 16 states and four Canadian provinces. Once infected, afflicted bats have been known to behave erratically, flying far from their nests, never to be seen again, making it difficult to identify the true impact of the disease. Now, scientists have learned that the situation is far worse than they once thought. Yesterday, the U.S. Fish and Wildlife Service issued a report that puts the death toll at an estimated 5.7—6.7 million bats — five to six times higher than a less rigorous count conducted in 2009. The spread of the devastating disease is only expected to continue. If a cure cannot be found, or the bats are unable to adapt, the consequences, say researchers, could be disastrous. The difference is we may be seeing the regional extinction of multiple species... Unlike some of the extinction events or population depletion events we've seen in the past, we're looking at a whole group of animals here, not just one species. We don't know what that means, but it could be catastrophic. Apart from the loss of species diversity, another major consequence could emerge in the form of rising food prices. Over the course of one summer, a single colony of brown bats can consume enough adult cucumber beetles to prevent the laying of 33-million corn-ravaging rootworm larvae. If bat populations continue to drop, then their prey — including insect populations that feed on commercial crops — stand to experience population booms. So where do conservationists go from here? According to the press release issued by the U.S. Fish and Wildlife Service, "numerous research projects to support and assess management recommendations" and improve our understanding of the dynamics of the disease are already under way. 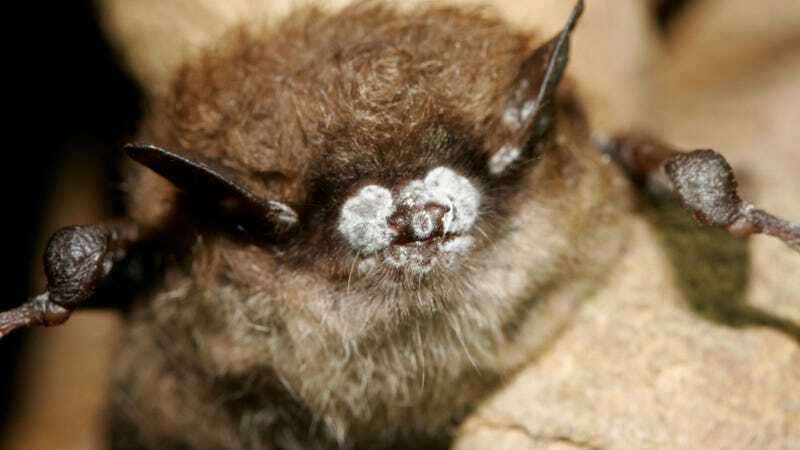 One such study even found a potential link between the fungus ravaging North American bat populations, and a similar infection that European bats have managed to survive. With any luck, studies like this will provide insights on how to best proceed. Read more at The Washington Post and MSNBC.